The Exploration view can be opened for an arbitrary selection of elements in the Navigation view or via the context menu within other views. 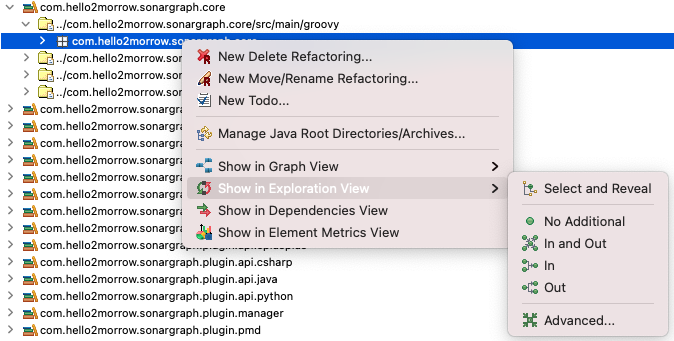 The Exploration view orders the displayed elements, with elements on top having more outgoing dependencies and elements on the bottom having more incoming dependencies. Clicking on the plus-sign of an element opens nested elements, allowing to drill down to fields. 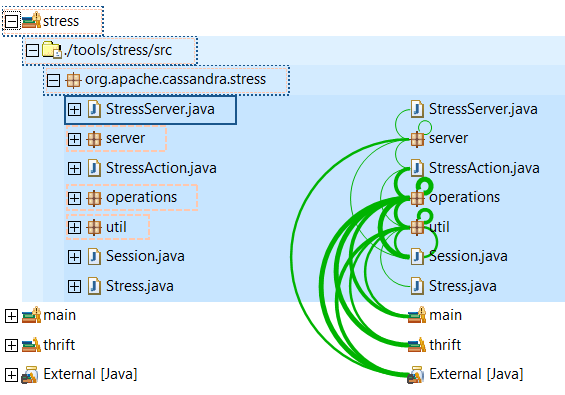 Arcs represent detected dependencies, which can be analyzed in more detail in the Parser Dependencies views and also in the Source view. This view offers interactions such as focus and unfocus which can be used to explore the dependencies of an arbitrary selection of elements inside the Exploration view and also provides highlighting, marking and zooming which can be helpful in the analysis of the content that is being displayed. Further details are explained in Section 7.10.1.2, “ Focus Modes ” and Section 7.10.1.6, “ Applying Focus ”.